Communicating climate variability has become an important issue with the recent slowdown in global surface temperature rise. Below are some examples of different aspects of communicating these issues, with a focus on regional spatial scales, but more examples would be welcomed! What works, and what doesn’t? Take a shuffled pack of playing cards with red cards representing ‘warm’ years and black cards ‘cool’ years. When dealing the pack there will be times when several warm or cool years appear together. Next, remove some black cards from the pack, and reshuffle. This pack now represents a changed ‘climate’ with less cool years. When dealing the pack for a second time, there will be more periods of warm years, but probably periods of cool years as well. Even though the climate has warmed, every year need not be hot! How variable is local temperature? The figure below compares global temperature variations with local temperature variations, specifically Central England Temperature, on the same scale. This highlights how although local temperatures can follow long term trends in global temperatures, they have far larger variations, and this is an example of why local temperatures are not representative of the globe in any particular year. Observed Central England Temperature (black) and global temperature (red) since 1850. What is the range of possibilities for CET in the future? Given the variability shown above, what does this mean for the future? 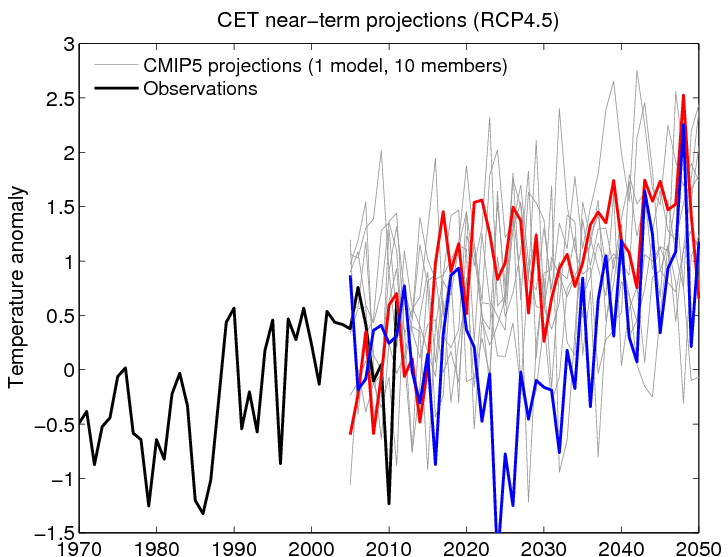 The figure below shows ten simulations with the same climate model for the coming decades, each with a different evolution of temperatures. For Central England this results in very different possible trajectories for the future, even though they all warm in the long term. Similar examples are also described here and here. Central England Temperature in ten simulations of future climate (grey lines), with two simulations highlighted in red and blue. Thanks GJ – agreed that this type of presentation is very useful! So there seem to be plenty of black cards left at least for the UK ! In Ireland Met Eireann recently upped their temperature averages by 0.4C, stating the local average had increased by that much since the mid-20th century. I reckon Ireland’s temperature must simply follow the sea surface of the Atlantic ! The HadCET linear trend from 1700-1900 is flat to slightly negative. That’s quite the hiatus in a general warming trend. The linear trend for the most recent century (1914-2013) is about 0.085ºC/Decade.